Illustrated here are several uses of the system of holes, Pups, Anchors, and stops described in the previous post. The simplicity of the layout engenders versatility. If it was tailored too narrowly to specific tasks, much of the creative range of the system would be sacrificed. As it is, introducing a piece of scrap wood here and there can effect solutions to the continually evolving work-holding demands of new woodworking projects. On the left side of the bench, a nice piece of scrap wood acts as a planing stop. It is secured to the bench with countersunk 1/2-13 flat head blots that go into the removable Anchors positioned in holes in the bench top. I prefer the recessed bolts because I am uneasy with protruding metal in the vicinity of a moving hand plane. Note that the “nice scrap” has an extra pair of holes that allow it to be used in a pair of holes parallel to the length of the bench with Anchors in them. The two pairs of holes in the nice scrap serve as permanent templates for producing other Anchor accessory pieces as needed. This kind of stop is also useful for work with the Domino joiner. 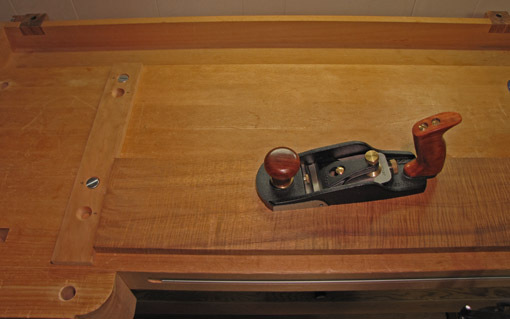 The photo below shows a board blocked on three sides using the stops on the left side of the bench, Pups in the vise chop, and a piece of scrap bolted into Anchors. Note that the pair of holes in the scrap are offset to one side, giving two effective projection widths from the Anchor points. Think of these scraps as extended dogs. The photo below shows a drawer held in position with creative use of Pups, Anchors, and scrap wood. 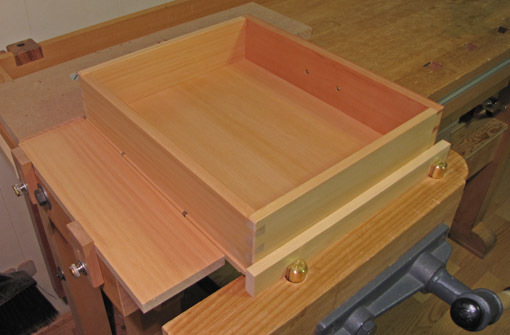 In this arrangement the top edges of the front and two sides can be planed without the work budging. On the right side of the bench in the photo below, the regular bench dog and tail vise system is used in conjunction with two Pups in their holes (prairie dogs?) that prevent lateral shifting of the work. This is an alternative to the setup on the left side of the bench and it can also accommodate options with Anchors. This three-sided blocking of the work piece is handy, for example, when scrub planing diagonally across the board, which might be necessary for this piece since it is too wide for my machine jointer. These systems are also especially handy for planing door frames which inevitably involves frequent changes in direction of attack with the plane. The main point is that there are surely undiscovered variations and creative adaptations of this system that will evolve as the work demands. 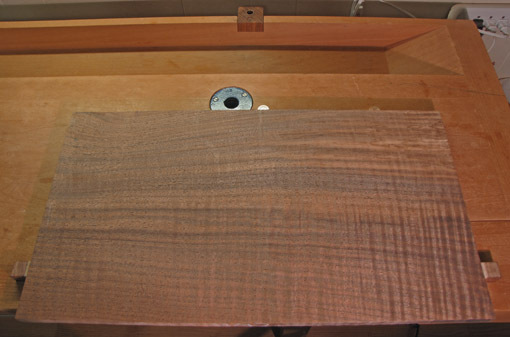 With a minimum of hardware and alteration to the workbench, its foundation is simple and easy – the way I like it. Good post. I like the system you’ve devised. I already have round dog holes in my bench so it would work well for me as well. Just curious, how thin of a scrap piece can be used with the anchors and the flat-head anchor screws? It would be nice if pieces say 1/8″ or a bit thinner could be used to the help with planing thin stock. Regarding how thin the scrap piece can be, the factors are: about 3/8″ of threaded depth in the Anchors, the length of the flat head bold, the Anchors are about 1 1/2″ long, and the depth to which they can be sunk below the bench surface will vary with the thickness of the bench top. Practically, since you can always find or cut a short enough bolt, I think the limiting factor for thin scrap wood will be how well the flat head bolt will engage a countersunk hole in thin wood. I like to use a separate MDF planing board with a very low fence on its front for working thin stock. I dog the board on the workbench. I agree with Mark Mazzo, you’ve developed a very comprehensive holding system. I’d like to suggest another bench accessory. 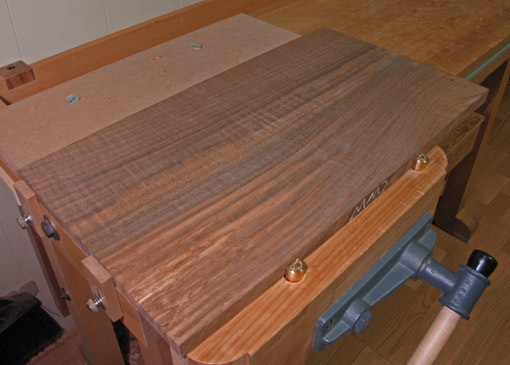 I use a lightweight bench (1.5″ plywood top). Heavy planing moves the bench. You can use a scrap of wood to stop a bench from moving exactly the same way you use it to keep wood from moving on the bench. It requires drilling a holes in your floor but it saves someone like me from having to build a 300 pound Roubo. How do you like the Veritas low angle smoother. It seems to have a little more room for a large hand than the Lie-Neilsen. I think my bench is probably about 175-200 pounds with another 100 pounds or so of gear on the lower shelf. I have high friction tape (Lee Valley) on the feet which sit on a varnished wood floor. A piece of router mat – the thin tan kind – also works well. This bench is extremely stable with this method. I like the Veritas low angle smoother. The option to easily transfer blades with different sharpening angles is very handy. The best aspect is its nice low center of gravity. The Norris type adjuster is also very good. I don’t like the shape of Veritas’ plane handles and consider this the biggest drawback of their planes. I would consider also the Lie-Nielsen if you are interested in a low angle smoother. It is a bit smaller and narrower which I like in a smoother – more like a #4. The Veritas LAS feels more like a #4 1/2. I read this with mixed feelings. I went to Kelly Mehler’s school in October and built an “h” (can’t spell it) workbench. I have trepidation about punching a bunch of holes into it. Although the utility will definitely be increased, the darn top and base is so beautiful that I really don’t want to distract from it. I just had the traumatic experience of putting in the dog holes! … But it still looks nice. BTW, the “course” was great and we even had a visit from Chris Schwarz. Best wishes for a happy new year. Keep up the good work! Holtzapffel? Congratulations on the construction! Lots of holes and clamping options. I put only as many holes in my bench, which is a very different style from yours, as I figured I needed after considerable forethought. I was worried they might be annoying but haven’t found them to be so. Good luck with the new bench.